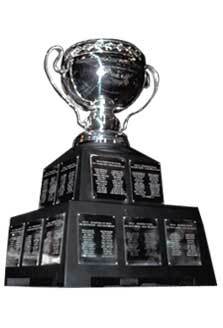 The coveted Calder Cup has been a motivational force for American Hockey League teams throughout the League's history and is awarded annually to the AHL playoff champion. The trophy is named for Frank Calder, who served as the National Hockey League's first President from 1917 to 1943. During the 1920's, Mr. Calder was instrumental in guiding hockey into the mainstream of American's major cities including Boston, New York, Detroit and Chicago, while helping in the formation of the American League. A total of 21 different cities have had their AHL member club win the Calder Cup, including the Cleveland Barons, who played in the AHL from 1936 to 1972 and won a record nine championships. The Hershey Bears have the most championships of active franchises with nine, the first in 1947 and the most recent in 2006.